Chemotherapy and vitamin therapy — is it safe to do them together? 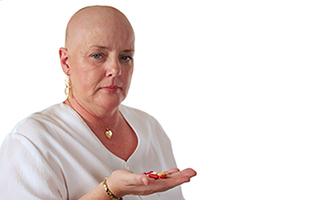 Chemotherapy and vitamin therapy —is it safe to do them together? Many if not most oncologists (cancer specialists) have the opinion that vitamins and other nutrients will decrease the effectiveness of chemo drugs. But is that true? Actually there is literally no evidence for the theory. In fact, the evidence is the opposite. Not only does the use of vitamins, especially antioxidant vitamins like vitamin C, not interfere with chemotherapy, it actually improves chemotherapy. So it especially makes me crazy when my patients come back from the oncologist saying they have to stop all their vitamins and other nutrients because they will block the effectiveness of the chemo. Nonsense! A recent study on the use of high-dose intravenous vitamin C with chemotherapy points this out. The researchers took nine men and women with advanced (stage four) pancreatic cancer. They gave them all very high doses of intravenous vitamin C twice a week while at the same time giving them the chemotherapy drug gemcitabine. Then they measured the progression of the cancer, their quality of life, their blood chemistry values, and overall survival. Here's what happened. According to the authors, side effects from the combination "were rare" and were limited to a few temporary cases of diarrhea and dry mouth. With a study as small as this, it's impossible to draw any clear conclusions about whether or not the combination worked better than the chemo drug alone. But with that in mind, the average survival time of these patients was 13 (±2) months. Compare that to the average survival without the combination which is 5 (±1) months. I think it's pretty clear that not only did the vitamin infusions not decrease the effectiveness of the chemotherapy, they probably enhanced it. In the researchers' own words, "Data suggest pharmacologic ascorbate [high-dose intravenous vitamin C] administered concurrently with gemcitabine is well tolerated. Initial data from this small sampling suggest some efficacy." So is this some kind of very special case? Or is it a good idea in general to combine chemotherapy with other biological therapies? In my mind, there's no doubt that this is typical. For the past 12 years, I've been using a combination of ozone therapy, vitamin C therapy, and chemo in my advanced cancer patients. And every single time the results are significantly better than what would have happened with just the chemo. The patients not only live longer, their quality of life is much better. So if you or a loved one is battling cancer, please take a hard look at all the evidence. I think you'll come to the same conclusion that I've come to. Before you do any kind of conventional anti-cancer therapy — whether it's surgery, radiation, or chemotherapy — please find a doctor who is versed in high-dose vitamin C, ozone therapy, nutrition, and detoxification to work with you while you're going through your treatments. And don't work with any oncologist who has the audacity to say that you should quit all of your vitamins and other supplements because they are supposedly going to interfere with his treatments. The evidence is just not there. Block KI, Koch AC, Mead MN, et al. Impact of antioxidant supplementation on chemotherapeutic efficacy: A systematic review of the evidence from randomized controlled trials. Cancer Treat Rev 2007;33:407–418. Welsh JL, Wagner BA, et al. Pharmacological ascorbate with gemcitabine for the control of metastatic and node-positive pancreatic cancer (PACMAN): results from a phase I clinical trial. Cancer Chemother Pharmacol. 2013 Mar;71(3):765-75.